When I was a little girl, I would occasionally wake up from a nap crying "take him down! It hurts him, take him down!". When my mom would question me, I would tearfully explain that I had been dreaming about Jesus, and I wanted them to take Him off the cross, because it hurt him so. The crucifixion has always affected me. Even now, I don't like reading the chapters in the gospels that detail the death of Jesus. I read them - but I don't like them. Last week, I was reading in the book of Matthew and inevitably came across the 27th chapter - the chapter that records Jesus' final hours on earth. As I read, with tears streaming down my face, as usual, I was struck by a thought that had never occurred to me before. I was reading the account of Pontius Pilate washing his hands of the blood of an innocent man. Pilate's wife had come to him and entreated him not to have anything to do with Jesus, as she had been suffering with dreams on account of him. Pilate tried numerous times to release Jesus, but was always met with "crucify him!". Finally, in an act of resignation, Pilate took water, washed his hands in front of the multitude and said "I am innocent of the blood of this just person: see ye to it." As Pilate washed his hands of responsibility, the multitude, including the Pharisee's and high priests answered, saying "His blood be on us, and on our children". I have always cringed when I read that! If only they would have known, they NEVER would have cursed themselves and their children by spilling the Son of God's blood. But, as I thought on this, I realized, that unbeknownst to them, they were, in fact, blessing themselves and their children and, in reality, every sinful human being ever to walk the face of the earth. Only by the blood of Christ are we washed clean. Only those covered in Jesus' blood can stand before the Father without blemish. Only those who cry out "let His blood be on us" can stand before the accuser with full confidence of victory. 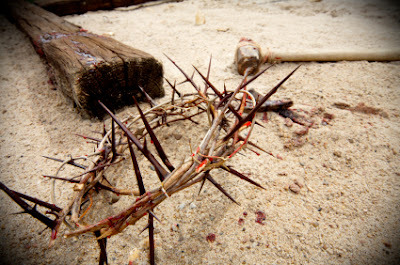 The truth is, every time we sin - every time we lie, cheat, steal, think unclean thoughts - we are chanting "crucify Him". But, by the Grace of God, we can be redeemed by the shed blood of Jesus. So now, I will bless my family. As I pray for my husband, for my parents, for my children and my brother, I will pray "let His blood by on us". Don't you love when God shows you something like this? Thank you. I totally agree. He did everything for us. Amen. Wow. Very wonderful words. I have had the same reaction to the account being so painful that I have avoided those chapters and then, one day, God showed me something that so amazed me that I don't look at it the same way now. I was actually lisening to one of those "social justice" preachers talking about how "Jesus would have done this or Jesus would have done that" and it dawned on me that our idea of justice and God's idea of justice aren't even close. If these so-called "Social Justice" Christians had been around in Jesus' time, they would have picketed the crusifixion and demanded that it be stopped in the name of what is socially just. And where would we be today? Still cursed under the Law. Our human hearts cry out that it was so unfair and horrible, but in God's economy that act was the most just, merciful, amazing act of all time. Heaven help us if the "Social Justice" crowd had been around back then. And so now I read the account and I cry, but I also have this overwhelming feeling of gratitude. The whole thing is simply amazing. Thank you for a lesson I've missed for years - for much the same reason, I shrink from those accounts. Now, I can read them with a new light on. It took me decades before I could understand the reason Jesus had to die for us. It never made any sense for me, until I looked at it from God's point of view instead of my own. Therein lies all the difference. There is a reason for everything under God's watchful love. Thank you for another very enlightening Bible lesson. "I realized, that unbeknownst to them, they were, in fact, blessing themselves and their children and, in reality, every sinful human being ever to walk the face of the earth." What a crock. you think that Jesus was crucified to Save us from our sins, and that by believing in him, that he is our salvation, that we can lie, cheat and steal? And then be totally exonerated because we believe he died to absolve us of our RESPONSIBILITY TO EACH OTHER? What kind of crap are you pushing, lady? We are admonished to LOVE ONE ANOTHER. That is the supreme commandment that Jesus spread. Do you think it is loving to lie to each other? To cheat? To steal? Wake Up!!!! I have no idea what you are talking about. I absolutely do not believe that being a Christian is lip service. Of course we can't lie, cheat and steal and just expect to be forgiven! Heaven forbid! I am saying that as human beings we are sinful, but when Jesus died on the cross, he gave us a way to be saved. Only those who believe in Jesus, confess their sins and repent will be saved. That is very clear in scripture. But, if we love Him, we will do what He says. That is also very clear. I'm not sure what your point was, but I do know that God made a provision for you through Jesus.